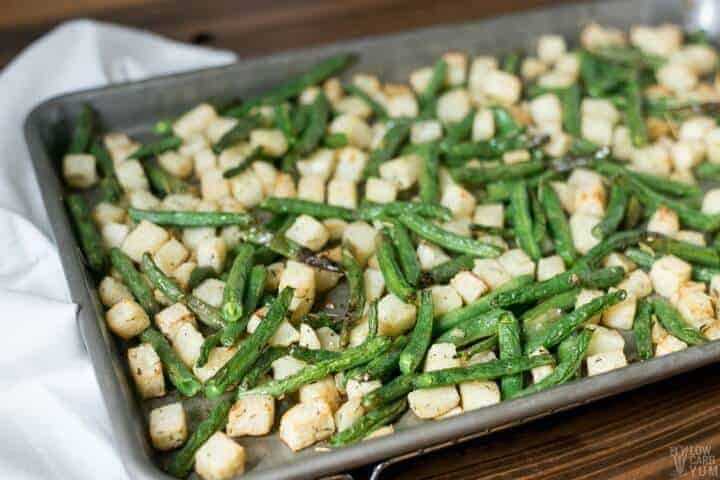 An easy roasted jicama with green beans that bakes up on a sheet pan. 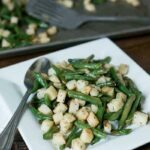 It’s a great paleo friendly recipe seasoned with olive oil, garlic, and herbs. While others are loading up the sweet recipes to prepare for the holiday season, I’ve decided to take a different route. Over the next month, I’m going to be eating a Whole30 AIP (autoimmune protocol) Paleo diet. The reason for changing paths is that I suffer from two different autoimmune diseases. The first is Grave’s Disease which is why I moved to a low carb diet. The second one is vitiligo which only showed up recently. If you aren’t familiar with the AIP paleo diet, it’s an elimination plan that removes inflammatory foods that often lead to autoimmune issues like mine. The diet is very restrictive because you can’t eat eggs, dairy, nuts, seeds, legumes, or nightshades. On the plan, the main foods are meats and vegetables. 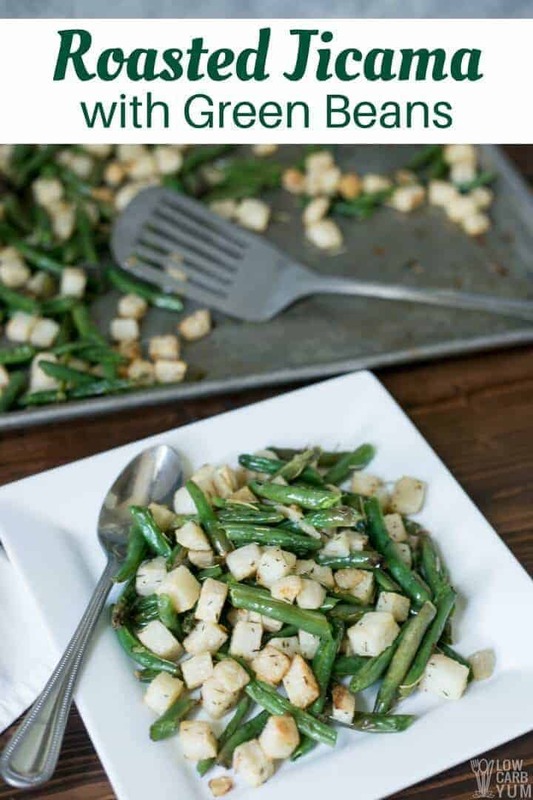 That’s why I’m starting this month off with a paleo friendly roasted jicama with green beans dish. 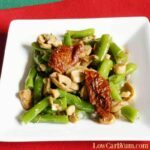 I should note that green beans are a legume, but they aren’t as harmful as other legumes so generally they are okay for a paleo diet. However, most people avoid them on AIP. Most people who follow the AIP paleo diet aren’t worried about carbs. But, since low carb has worked so well for me, I’m going to stick with lower carb foods. You may shy away from this roasted jicama because the carbs seem high. 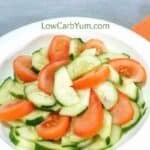 However, jicama only has about 11 grams of total carbs per cup. And, it’s a great source of prebiotic fibers. In fact, 6 of those 11 grams of carbs are fiber. 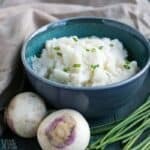 Jicama is also a great substitute for potatoes. I’ve even made low carb French fries out if it. I’ve used it as an apple substitute too. 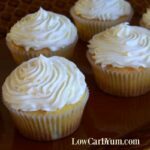 Just take a look at my low carb apple filling recipe. When you roast jicama, it doesn’t get soft and mushy like a potato. If you want it that way, you’ll need to boil it for a while first. I prefer it somewhat crisp so I roasted it raw. 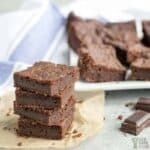 Most of my low carb recipes contain dairy so it’s going to be tough going dairy-free. However, because it’s so inflammatory, it’s best that I find alternatives to it. Since finding out I have a sensitivity to egg whites, I’ve really backed off on eating eggs. But, I haven’t given them up completely. After one of being egg-free, I plan to only eat the yolks and toss the whites. Hopefully, I’ll be eating more vegetable dishes as I move away from dairy and eggs. 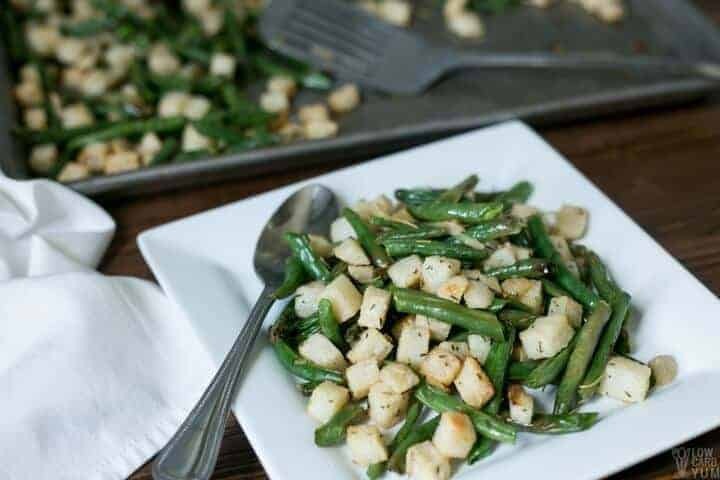 This roasted jicama with green beans is getting me off on the right track. I know eggs are a staple on low carb, but egg white sensitivity is quite common. The problem with egg whites is they contain an enzyme called lysozyme. 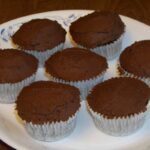 You can read more about it on The Paleo Mom. If you have an autoimmune disease or allergies, you may want to find a functional doctor who can run tests to see if you have a leaky gut and or food sensitivities. I also highly recommend reading the The Autoimmune Solution by Amy Myers, M.D. which gives you everything you need. Hopefully, through this blog and my other blog at All Natural Ideas, I can help others who suffer with autoimmune diseases like me. Even though I showed no sensitivity to gluten or dairy when I was tested for food sensitivities, I’ve eliminated both because they are inflammatory which makes my autoimmune conditions worse. 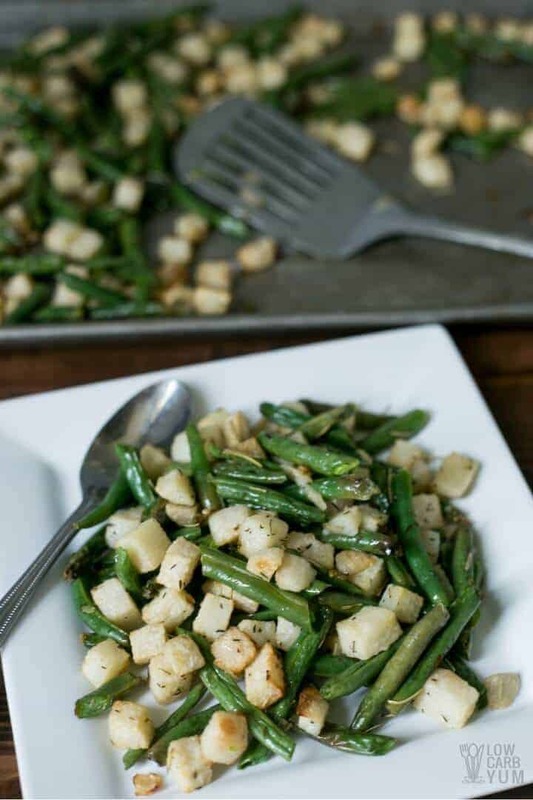 An easy roasted vegetable dish with jicama and green beans. 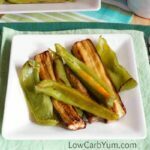 It's a delicious paleo friendly recipe seasoned with olive oil, garlic, and herbs. Blend jicama with half the olive oil. Then stir in the garlic, rosemary, thyme, and salt. Spread out on rimmed baking pan. 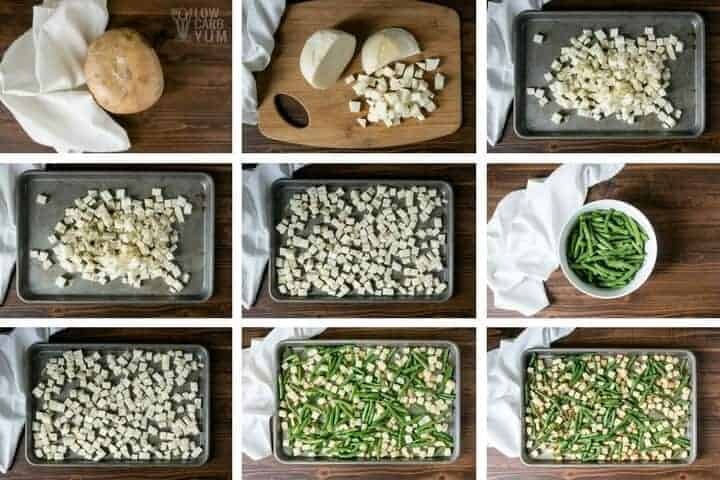 In a bowl, mix the green beans with the remaining olive oil. 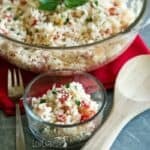 Combine with jicama on baking pan. Bake at 400°F for 45 minutes, stirring the vegetables every 15 minutes. Serve immediately.